A rapid test for the qualitative detection of Strep A antigen in throat swab specimens. For professional in vitro diagnostic use only. 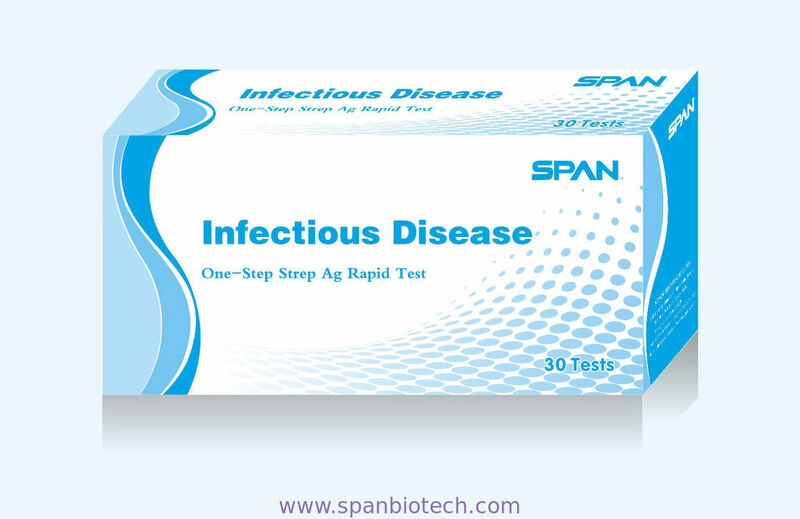 The Strep A Rapid Test Cassette (Throat Swab) is a rapid chromatographic immunoassay for the qualitative detection of Strep A antigen from throat swab specimens to aid in the diagnosis of Group A Streptococcal infection. The Strep A Rapid Test Cassette (Throat Swab) is a rapid test to qualitatively detect the presence of Strep A antigen in throatswab specimens, providing results within 5 minutes. The test utilizesantibodies specific for whole cell Lancefield Group A Streptococcus to selectively detect Strep A antigen in a throat swab specimen. The Strep A Rapid Test Cassette (Throat Swab) is a qualitative, lateral flow immunoassay for the detection of Strep A carbohydrate antigen in a throat swab. In this test, antibody specific to Strep A carbohydrate antigen is coated on the test line region of the test. After the test strip is immersed into a specimen, the extracted throat swab specimen reacts with an antibody to Strep A that iscoated onto particles. This mixture migrates up the membrane to react with the antibody to Strep A on the membrane and generate a colored line in the test line region. The presence of this colored line in the test line region indicates a positive result, while its absence indicates a negative result. To serve as a procedural control, a colored line will always appear at the control line region, indicating that proper volume of specimen has been added and membrane wicking has occurred. 1. For professional in vitro diagnostic use only. Do not use after expiration date. 2. Do not eat, drink or smoke in the area where the specimens and kits are handled. throughout the procedure and follow the standard procedures for proper disposal of specimens. 4. Wear protective clothing such as laboratory coats, disposable gloves and eye protection when specimens are assayed. 5. Humidity and temperature can adversely affect results. 6. Do not use test if pouch is damaged. 7. Reagent B contains an acidic solution. If the solution contacts the skin or eye, flush with large volumes of water. 8. The positive and negative controls contain sodium azide (NaN3) as a preservative. 9. Do not interchange reagent bottle caps. 10. Do not interchange external control solution bottle caps. Store as packaged in the sealed pouch at room temperature or refrigerated (2-30°C). The test strip is stable through the expiration date printed on the sealed pouch. The test strip must remain in the sealed pouch until use. DO NOT FREEZE. Do not use after the expiration date. 1. Only use reagents and sterile swabs provided in the kit. 3. Testing should be performed immediately after the specimens have been collected. Swab specimens may be stored in a clean,dry plastic tube for up to 8 hours at room temperature or 72 hours at 2-8°C. Transport swabs containing modified Stuart’s or Amies medium?can also be used with this product. Strep A Rapid Test Cassette (Throat Swab). Allow the test device, specimen, reagents, and/or controls to reach room temperature (15-30°C) prior to testing. performed immediately after opening the foil pouch. 2. Hold the Reagent A bottle vertically and add4 full drops (approximately 240 uL)of Reagent A to an extraction test tube. Reagent A is red in color. Hold the Reagent B bottle vertically and add 4 full drops (approximately 160 uL)of Reagent B. Reagent B is colorless. Mix the solution by gently swirling the extractiontest tube. The addition of Reagent B to Reagent A changes the color of the solution from red to yellow. 3. Immediately add the throat swab into the extraction test tube of yellow solution. Agitate the swab by rotating it at least 10 times. Leave the swab in the extraction test tube for 1 minute.Then express the liquid from the swab head by rolling the swab against the inside of the tube and squeezing the tube as the swab is withdrawn. Discard the swab. 4. Fit the dropper tip on top of the extraction test tube. Place the test device on a clean and level surface. Add 3 full dropsof solution (approx. 100 μL) to the specimen well (S) and then start the timer.